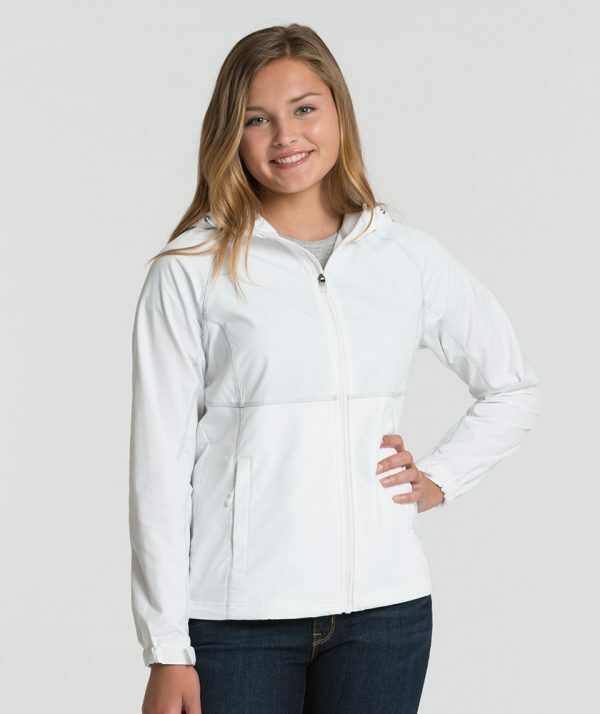 The Charles River Apparel 5611 Women’s Latitude Jacket is available in Women’s sizes XS-3XL and can be purchased in your choice of the following colors: Black, White, Nautical Blue and Teal. SKU: CR-5611 Categories: Activewear, Jackets, Jackets, Water Resistant, Waterproof Jackets, Women's Clothing, Ladies Activewear, Women's Jackets, Outerwear, Black, Blue, White Tags: ladies activewear, water resistant, Women's Jacket, Women's Waterproof Jacket Brands: Charles River Apparel. This Women’s Latitude Jacket is perfect for active women and is designed to match with the Charles River Apparel Men’s Latitude Jacket, style 9611. Lightweight 100% polyester textured fabric with a durable, water resistant surface for protection from the elements. Full zip with wind flap. Adjustable cuffs with hook & loop closure and covered zippered side pockets. Hood and open hem with adjustable shockcord drawstring. Raglan sleeves for wider range of motion. Fitted styling.